I didn’t sleep particularly well and woke up early the morning of day 6. There were a few contributing factors. The wind howled much of the night, I might have imbibed one too many IPAs for restful sleep, and I knew we were headed back to Portland in the morning. Sad face. 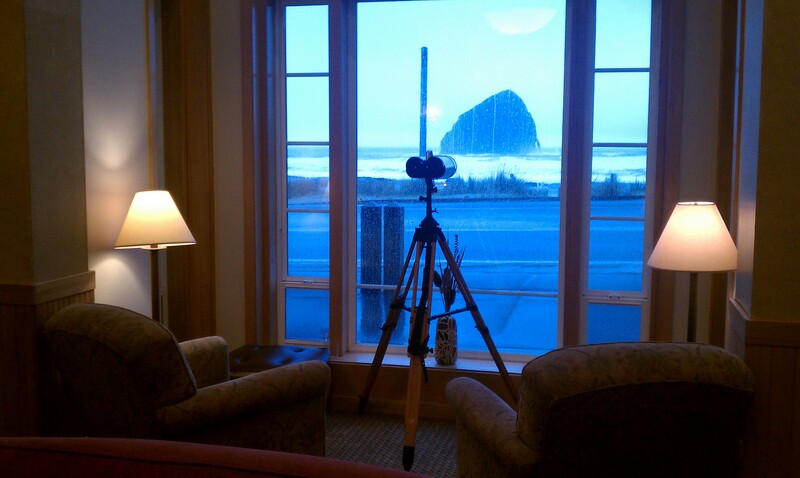 The weather was still nasty, and the Inn at Cape Kiwanda was on the business end of Mother Nature’s fury. The view from the cozy confines of my room, however, was both beautiful and amusing. There were occasional sun breaks above Haystack Rock; that was the beautiful part. The amusing aspect of sunrise was getting to watch a couple of my intrepid counterparts attempting to get to the dunes of Cape Kiwanda in order to snap photos in the morning light. I love photographers; real photographers that is. I consider myself one, but only in the academic sense. I have a semi-nice camera, I take lots of shots, and some of them turn out nice. But real photographers, they wake up early, they hone their craft, and they occasionally place themselves in harm’s way. On this morning, you could make the argument that my comrades were doing all three. 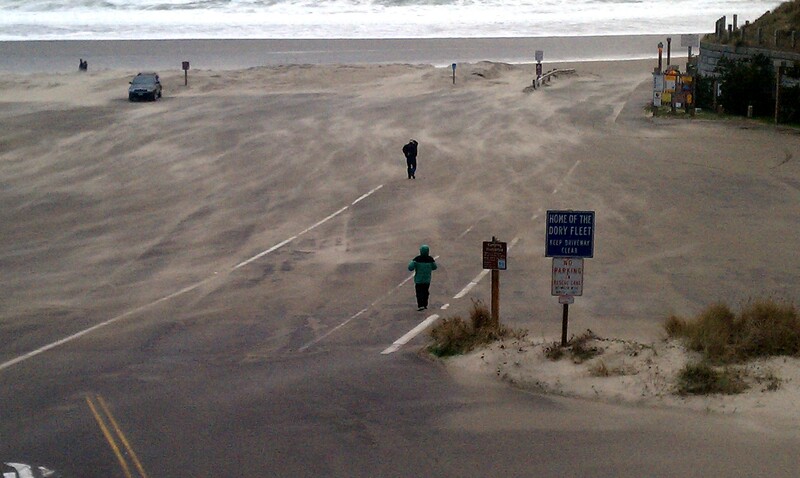 They were essentially getting sand blasted as they made their way across the parking lot to the dunes. Knowing full well that no real harm would befall them from this attempt, I chuckled out loud and only occasionally heckled them from my balcony. 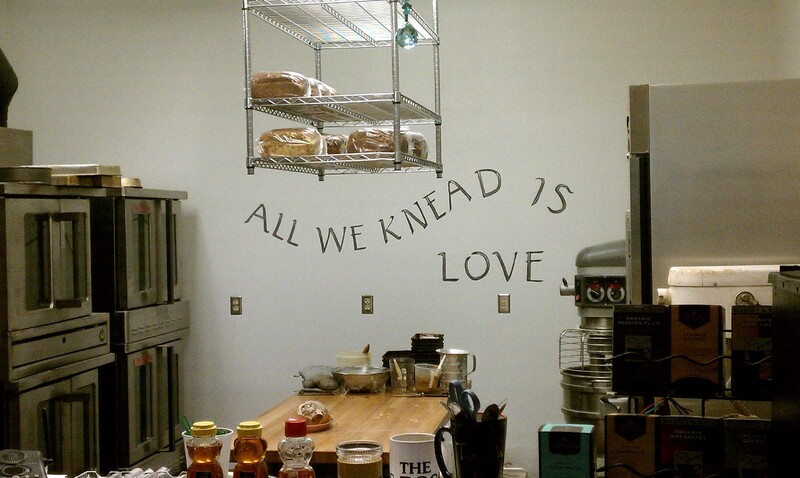 We checked out, posed for a group photo, and left the Inn for breakfast at the Grateful Bread. The bakery and restaurant served up a deliciously hearty breakfast, made all the better by the fresh baked bread that now accented my plate in toast form. Weather being what it was, we were able to drive into the Nestucca Wildlife Refuge but not able to explore and take photos. There was also the potentiality of a trip to Munson Creek Falls which would have been great, but as a group we decided that the promise of ice cream in Tillamook was more appealing than the rain and mud of the trail. 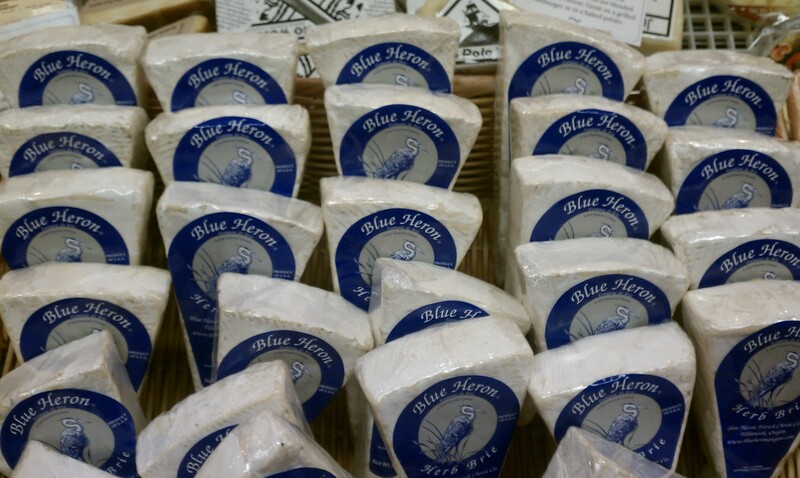 Now back in Tillamook, we stopped in at the Blue Heron French Cheese Company. I love this place. I’ve probably been there 5 or so times in the last 4 years and it’s always a treat. In addition to all of the wines, cheeses, and assorted gourmet foodstuffs, they have a petting zoo. (On a side note, the petting zoo is great for kids. But be aware that a couple of the goats are greedy and will steal your whole bag of treats when you’re not looking. Keep your head on a swivel when visiting the petting zoo!) This was supposed to be our lunch stop but since we weren’t able to engage in any of the scheduled photo ops, we got to the Blue Heron a little early. No worries though. 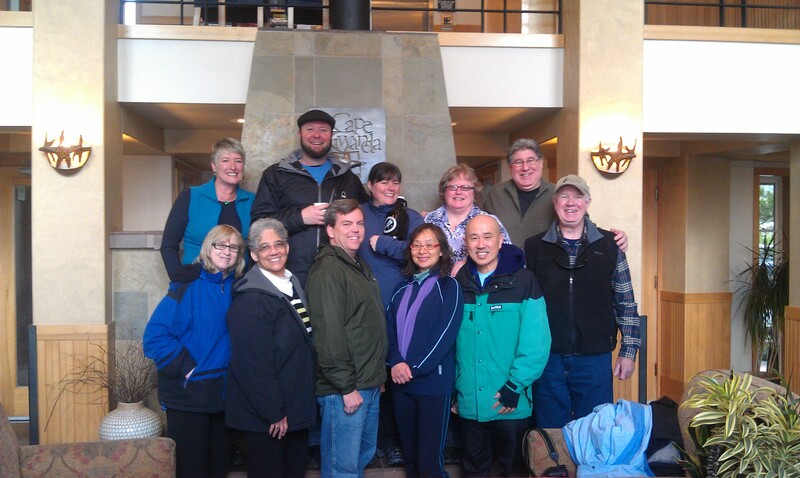 We tasted some cheese, sampled some wine, and they packed us up lunch to take on the road with us back to Portland. Thanks to Alex Hurliman Christopher, Sales & Marketing Manger at the Blue Heron, as well as the delightful staff. It’s rare that you encounter a staff so hardworking and helpful that is also so attractive you can’t stop blushing. Just because we weren’t hungry enough for lunch, didn’t mean we weren’t ready for dessert. 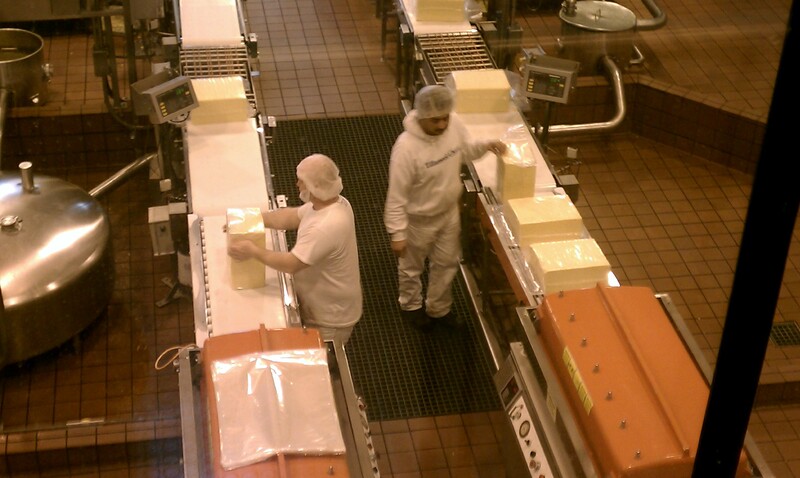 Our last official stop of the North Oregon Coast Press Tour was the Tillamook Cheese Factory. I’m fairly certain that there is legislation on the books somewhere, dictating that it is unlawful to leave Tillamook County without visiting the cheese factory. We all casually strolled along the self-guided tour route. We then sampled cheeses and were treated to complimentary ice cream cones of our choosing. For your information, the onsite store is the only place you can buy their famous Squeaky Cheese. Now it was time to load back into the van one last time and make our way back into Portland. This little trip was not without peril, however. Through the passes of the Coast Range the snow began to fall, at times quite heavily. This was one more time I was glad that Tracie Driver was on my team. She led us expertly across the snow laden roads of the Coast Range and delivered us back into the safety of the Willamette Valley. Soon we were dropped off where it all began six days earlier, at the Portland Airport Shilo Inn. This was my first press trip and I was sad to see it end. As busy as we were and as tightly scheduled as every day’s agenda was, it was a ridiculously fun experience that I was lucky to be a part of. Even though it was technically a work trip, I still consider that week to be the best “vacation” I’ve ever had. I hope I have the chance to participate in more of these trips in the future. As a matter of fact, I hope and pray like nobody’s business that I can do these for the rest of my life. During the trip, other travel writers regaled me with tales of prima donna freak outs and tirades unleashed by other writers that must have become a little too accustomed to the good life. As you probably already know, some people can find the dark side of any moon. That being said, if I ever find the gall to complain that the free coastal accommodations aren’t up to snuff, would you do me a favor? Please track me down and slap the taste out of my mouth.